Spectacular views and deluxe furnishings will make Poipu Kapili #22 your home away from home. This spacious and comfortable home has an air conditioned master suite and two full bathrooms. Enjoy the ocean views from living room, dining room, kitchen and lanai. Drift to sleep in the luxury of a king bed. The views will provide you with endless hours of seasonal whale watching and ocean views. Poipu Kapili is one of the finest resorts on Kauai. With only 60 units on five beautifully-landscaped acres Poipu Kapili offers maximum privacy. Relax and enjoy the view from the pool and BBQ area as well. Keep in shape and play tennis at one of the two courts located on site. Snorkeling and beach swimming is across the street adjacent to the Sheraton Hotel. Enjoy an evening walk to restaurants and shops at the nearby Poipu Village or Kukui'ula Shopping Center which features 'Roys' restaurant. Located on the sunny south shore of Poipu near world famous beaches, the Garden Isle of Kauai will not disappoint. We want your Hawaii experience to be something you can not wait to repeat. We own and manage our own property and can give you the individual attention that makes the difference. Poipu Kapili is a complete 'NO SMOKING' property. There is no smoking allowed inside our unit or anywhere on the common area. The owners of this beautiful home travel here frequently and enjoy upgrading their home and providing details that all travelers enjoy. 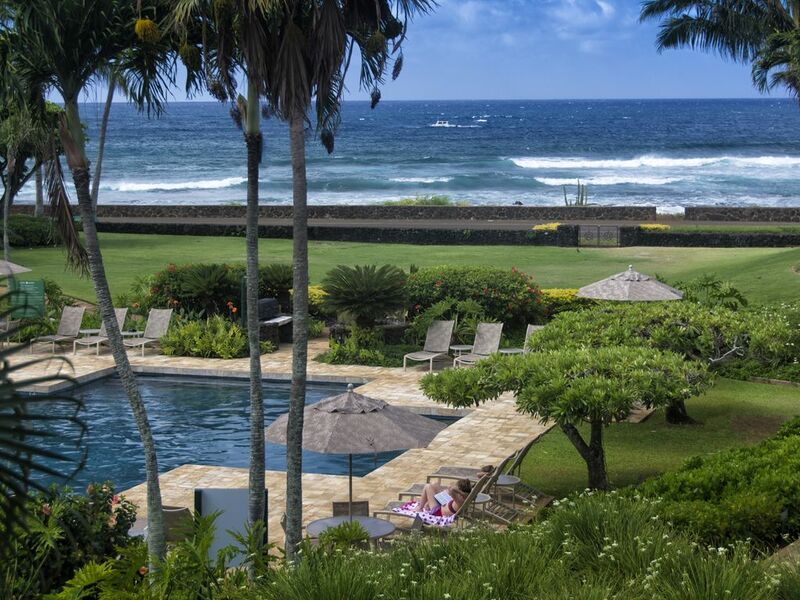 Poipu Kapili is the premium property on the entire south shore. Poipu has the best weather on the island. We can walk to so many things, making getting in the car totally optional. You can walk to the beach with no hassle. You can walk along the water to more restaurants than you can eat at in a weeks time just at Kukui'ula alone. Weekly farmers markets also provide local foods to enjoy in the privacy of your home away from home. Luxury linens and towels all provided. Reserved parking just steps to the front door. Comfortable over-stuffed chairs and couch - perfect for hours of relaxing and enjoying the ocean views. Remodeled and upgraded. Fully equipped. 2 tennis courts - no extra charge. Kiahuna Golf course and Famous Poipu Bay Golf Club located at the Hyatt Hotel are just 5 minutes or less away. Extra large pool, 3/4 of the pool is 5 feet or less. Perfect for cooling off and relaxing. We have stayed at the Poipu Kapili property 4 times and it is as lovely as it gets. Great location, beautifully maintained grounds and a special setting by the ocean. Unit 22 is the nicest and best equipped one that we’ve experienced. It has virtually every amenity you would expect and the attention to detail is really awesome. Cynthia is the ultimate professional and is really nice, too. We will return as soon as we can!! Great location and perfectly appointed condo! We have been coming to Kauai for over 25 years and this is absolutely one of the best locations and condos in which to enjoy this fabulous island. Sunsets at the wall, the whales breaching, lovely gardens, and so much to do within walking distance made for a perfect vacation. We will be back! Absolutely wonderful two week stay in this condo. Beautiful spacious interior tastefully decorated with classic Hawaiian designs. Appreciated the a/c as well as fans. We found the unit to be very well stocked with kitchen and bathroom supplies as well as sports equipment for snorkeling, tennis and beach. The lanai offers a beautiful view of the well kept grounds, salt water pool and the ocean. It was our go to place to enjoy any meals we prepared. The resorts herb garden for meal preparation was a bonus! We found this unit ideally located for short walks to two different shopping areas, restaraunts and fresh markets. Greatly enjoyed sunset visiting at the “wall” at the oceans edge directly in front of the property! We would highly recommend your spacious unit, Cynthia, to anyone wishing to stay at Poipu! Wonderful! Location can't be beat! We loved our stay at PK22! From the moment we engaged Cynthia to book everything was so easy. She was great to work with and the unit is spectacular. The pictures in the listing don't do it justice. The place itself was well equipped and seemed to have everything you could possible need. We didn't prepare a full dinner in the unit but it was nice to have the option. The unit was very clean and pride of ownership was apparent. The air conditioner in the bedroom was a welcome bonus given the trade winds stopped blowing for a few days while we were there. The salt water pool was heavenly at the end of a long day of hiking and exploring. The biggest benefit for us in this unit was the location. We really wanted to be somewhere that we could walk to restaurants for dinner. Being able to walk to the shops at Kukui'ula made our trip. The walk was easy (about 15 mins) and had a paved sidewalk for the entire walk. It was also a short walk to a fantastic beach and had an absolutely breathtaking view from the unit. We can't say thank you enough to Cynthia for letting us use her unit for our stay. We highly recommend the unit. It was wonderful and we definitely hope to be back! We loved this condo. Everything was first class...the view, the pool, the amenities, the location and the suite. There is tons to do in the area that will keep any enthusiastic traveller busy from sunrise to sunset. Cynthia was a pleasure to deal with. I’d highly recommend this property. First off, all of the nice things said about this property in previous reviews are true. The two of us were celebrating our 50th anniversary and spent eight days at PK 22. The condo was perfect in every way for our needs. It is very tastefully decorated with much attention to detail from the kitchen set-up to the high quality towels and linens. The location can't be beat if you are considering staying in the Poipu area. The salt water pool was an added bonus. It was seldom crowded and the water was so soft, unlike a chlorinated pool. Having coffee in the morning on the balcony overlooking the pool and ocean was heavenly. If comparing to similar high quality rentals in the Poipu area you will find this to be a real good value. Owner/manager easy to to work with and responsive. We will be back! Ideally located less than 10 minutes walk to beaches, restaurants, boutique shops, coffee, groceries, shave ice, snorkeling, boogie boarding, swimming - You never need to get in your car! If you do get in your car, we are half way between the Canyon and the west side sights and the North Shore. Less than 1 hour to both. Quite side of Poipu but still very convenient. MINIMUM STAYS (unless there is a shorter gap) 5 nights except..... 7 nights Jan-April 7 nights Christmas/New Years MINIMUM STAY: 5 nights MINIMUM STAY: Christmas/NY: 7 nights We do not book more than 11 MONTHS in advance Cleaning fee: additional cleaning fees for longer stays Fully refundable $300 security deposit needed to hold dates. Balance due 60 days prior to arrival. Longer stays require different payment schedule. Once rental fees are paid they are non refundable unless time is re-rented. Credit card fees charged on balances (not security deposit) 2.5% for US, 4% for international Rates are subject to change without notice. We will never ask you for a wire - be careful if someone asks - it might be a scam.